I'll never ever forget getting my first son back after cutting him. It broke my damn heart. I *knew* I did a bad thing. Thank you so much for sharing your story. Its powerful stories like this that will change minds. 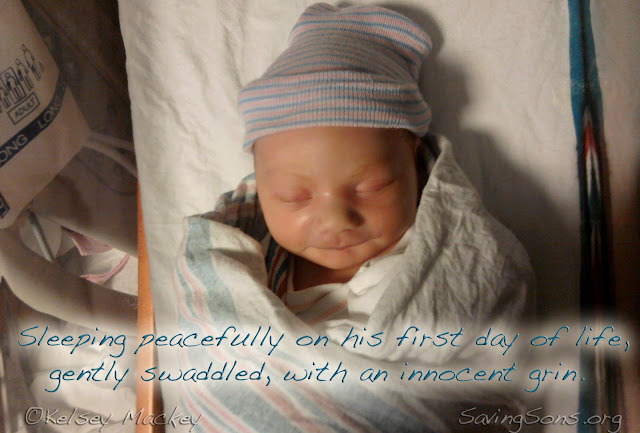 These pictures and story (I shared it) just helped save a baby! I want to thank you for sharing your story publicly. You are a hero. No one's perfect, we all make mistakes, even avoidable ones, but the real test comes when you have a chance to recognize it, accept the truth, and do something about it. And that is a hard thing to do, which is why not everyone does it. I admire your bravery and ability to do this. My heart goes out to you and your boy. I shared your story to help you out with spreading awareness. Do you know about restoration? if not, learning about it can be very helpful for you and your son in the future. When he gets old enough to fully understand, you can give him info about it. Sending positive vibes your way. I feel so strongly about little boys remaining intact. I wish I could shout if from the rooftops, to friends, relatives, and strangers alike. When I've tried to broach the subject with my closest friends, no matter how gently, I've been met with a great argument, enough that it nearly alienated us. I merely would love for them to just research the topic, but to no avail. It makes me so very sad. And I don't know if I could ever convey how much I question how we could hurt a baby in such an awful way. Babies scream when they're cold or hungry. Imagine having skin cut off such a sensitive area? I cannot. Terrible. Traumatic. Wrong. What can I do? No doctor worth his or her oath would ever subject any living being to this. As long as there is $ to be made, there will be doctors who put their greed before their ethics and morals. Preying on unsuspecting parents who put their trust and faith in the medical professionals. No doctor should be allowed to do this. Since the uproar on using aborted fetus material, the capitalistic companies that make cosmetics, like anti-wrinkle creams for your vane grannies and aunties.So foreskins are a boon to business and parents are so gullible it is understandable they will let their child be mutilated. Once more money stands above all. It is stories like yours that convinced me 100% to leave my twin boys (also born in 2010) intact. Please keep sharing your experience - it absolutely does help and will change minds. Ive gotten my foreskin snagged in my zipper a few times and my god the pain is horrendous. It hurts so much. To have it cut off would be just unbearable pain and agony. Now imagine that but in an infant who is even MORE sensitive to pain. It honestly disturbs me how many people think it doesnt hurt. If cutting off a body part from an infant doesnt hurt, then infant abuse wouldn't even be a thing. If a slap to the face of an infant hurts, cutting off their foreskin hurts WAY MORE! This procedure when done without medical reasoning, should be considered child abuse. Because it is. "Ive gotten my foreskin snagged in my zipper a few times"
A few times? Mate, just slow down - you get paid for bathroom breaks! Your pictures say more in two frames than all the history, myths, and justification bias in the world. Only the human heart can read those two expressions. Those pictures are just heartbreaking. Your story is very powerful. Babies ....dont need cutting. When do you reckon its 100% necessary? I heard if the skin doesnt move down by two they need to do it, more for physical than stetical reasons! Is that right? Wow...this really struck a cord with me because I had literally the SAME experience as you on almost the same day as well! My son was born on October 20 2010 and literally same thing. I thought I knew what I was doing, I thought it was so routine. I assumed they used pain relief. I just DID NOT KNOW...and the newborn pictures were right after as well! I regret it hugely and am saddened that I didn't know the error of my ways. It's so strange how we had an identical experience! He looked so detached and worn out after the procedure...I will never forget how he looked at me. I vow to keep any future sons intact as well. Thanks for putting into words my feelings exactly. What has helped you heal? I want to restore his foreskin but not sure if this is possible in young boys. I know it's not the same but it will make me feel better. Hey mama. So sorry you're dealing with regret. Foreskin restoration is an involved process of stretching skin. Its not something that you would be able to do as his mother. My best advice would be to look into it. Have the information ready. You can give your son the information so he can choose as an older teenager or adult if he wishes to restore. So similar to my own sad memories, like a knife slashing through the joy and love of new parenthood! I was fortunate enough to have a doctor from another Country (not a U.S. doctor) talk this issue over with me. Back in our day, it was so standard, I'd never heard of it not being done. However, after listening to the doctor and the details, I opted NOT to have this done. I'm delighted to know that others are being informed. It's mutilation, plain and simple. If I ever have a son I will not get him circumcised and if my husband fights me on it I will fight him harder. So incredibly unnecessary. So glad I found what you have written. That you for sharing! Let us declare circumcision on a boy below the age of eighteen years is illegal. "Be a hero, don’t circumcise your son." This just broke my heart. Lots of hugs to you. I would not have researched this much, either, unless my husband (circumcised) was so opposed to it, and then I learned about the pain it can cause. It is so brave of you to share your story. I very nearly went along with the idea of circumcising my first son (after two girls). My husband and I nonchalantly thought it was just routine and simple, then a random event led me to briefly question circumcision. I then, at 7 months pregnant, delved myself into research on circumcision and learned the truth. Kelsey, thank you for sharing your story. Take heart in the fact that brave people like you, who are helping to spread the word, are helping people like ME and my SON! The rate is dropping, keep up the good work. Your son is precious and will, no doubt, enjoy a fabulous life being loved and loving others. 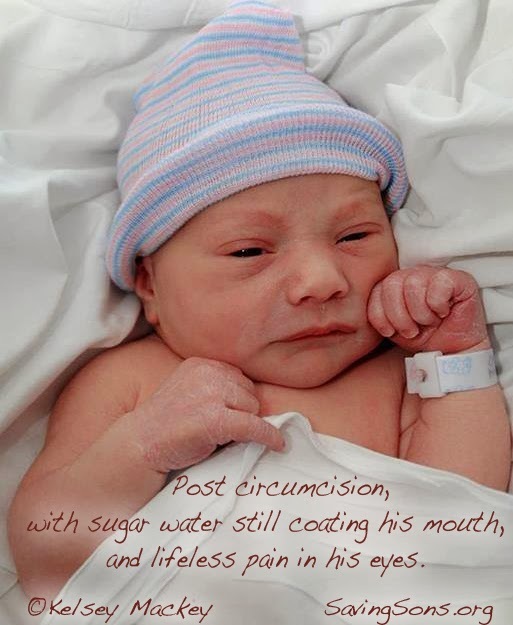 My father was against circumcision and taught me from a young age how cruel and barbaric it is. When my son was born, I told the hospital staff NO and even put a sign on his crib. A teen mother asked me why not as she had a son. I said its painful, and dangerous and the choice should be with your son. Do not make this decision for him. Well the doctor came by and said its for the best and then they took the little guy into a room next to us where he screamed bloody murder for almost an hour. When was brought out in blood soaked sheets, they said he would have to be hospitalized longer because of complications. The teen mom went hysterical demanding to know why I did not stop her. It was an awful experience and I will never forget those screams. The pain and fear and rage that these poor boys endure I think may damage them for life. Oh wow, the two pictures are like night and day :( If he were my son I would also be torn up inside and it would be very difficult to forgive myself. Please try not to torture yourself for the rest of your life, though, we all make mistakes. Our culture makes circumcision seem like it's not a big deal--many of the boys/men I've known who've been circ'ed also thought it wasn't a big deal (like my brothers and father) which only strengthened the idea in my mind that it's okay. It wasn't until the last five years or so that I've really faced the issue because I was pregnant and I didn't know if I was having a boy or a girl. As it turns out I have a little girl but I decided before she was born that if she was a boy I would definitely NOT have him circumcised. If I hadn't done the research I did and listened to my gut then I would have been like so many other Americans who follow blindly. It wouldn't have been so easy, so simple. So please don't beat yourself up, it can happen to anyone, and, unfortunately, it does. I'm so sorry and I thank you so much for sharing your story! I've been struggling with the decision of whether or not to have my son circumcised (I'm due May 14th) and have asked everyone I know, friends, family, even doctors (who said it's really my choice) but all but 2 of my friend/family members told me to have him circumcised bc of medical reasons, it's cleaner, it'll be easier for him later in life, etc. After reading your story (and bawling my eyes out, probably bc I'm hormonal or maybe it just touched my heart that much), I just don't think I could put my child through something like that! Thank you so much! You've probably saved both me and my son from a lot of pain, heartache, and regret!